Here’s an a long term indicator that I stumbled on that has been able to time the stock market’s generational buy points very well. 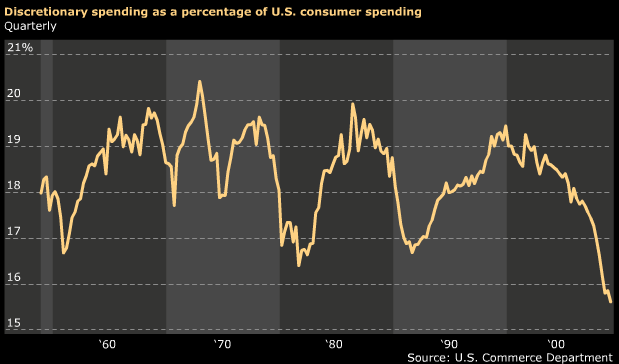 It is a ratio of discretionary spending to total US consumer spending. Every time that the US Consumer rediscovers frugality and retrenches by spending less on the non-essentials, the stock market makes a major bottom. In the early 1960’s discretionary spending as a percentage of the total budget went below 17%. We then had the roaring market powered by the “nifty fifty”. In the early 1980’s again discretionary spending went below 17%, reaching a slightly lower level. And again, we saw the birth of the 80’s “go go” bull market that was rudely interrupted by Black Monday in October 1987. In the early 1990’s discretionary spending once again breached 17% and once again the market made a low (in late 1990) that would go uninterrupted until the LTCM crisis in the summer of 1998 and top out in 2000 at the height of the tech bubble. Which brings us to the most recent - and seemingly the most depressive state of the US consumer. Belt tightening is so rampant that discretionary spending is at an all time low for at least 50 years. No wonder we are constantly hearing today’s economic situation compared to the Great Depression. But if the previous dark times are any indication, the stock market is poised for a shocking come back. Very interesting graph and conclusion. We’ll have to see how it plays out but I think everything you looked at could be sum up in the ability of US consumer to expand credit usage, especially staring from the 80’s to now. For most of the other times I suspect that as US consumer retrenched, the savings went first into savings then into the equity market. Even in the 80’s and early 90’s there was still some savings along with the introduction of mutual funds to the j6p investor class. This downturn however is marked by actual reduction in wages and repaying of accumulated debts over the last decade thus the sense of US consumer frugality. Also I suspect that the savings if any will not find it way back into the equity in great quantity. I think we still have a much higher high in the foreseeable future but it is not as high as many thinks. Good points both by Babak and Mike cheers. I love this chart!! I want to build this chart into my Bloomberg. Could you please tell me the ticker of these two statistics? Thank you. Interesting observations, but this relationship is observed only since the 60’s — a period when the US had youthful demographics. That is changing so discretionary funds may not flow into equities as in the past. Also one might ask, “have we reached the bottom and how long might this curve stay near the bottom?” In the mid-70s the answer was “no,” and the curve remained low for 4 years. Could this cycle last significantly longer than 4 years?